want to have the hunting trips that you can wax poetic about. So, warts and all, here’s the Marauder. I’m not one of those people that prioritizes power over all else, but I have to say that I am incredibly happy with the power on this one. The Marauder really can shoot pretty far away – and not have too much of a drop off in accuracy – simply because it pushes so much behind every shot. One of the issues, though, is that it really is very air hungry. You can get a good 20 incredibly powerful shots off, and then you have to refill it again. That means that either you’re going to be pumping for a while, which will leave you tired, or you have to get a separate kit for filling with a scuba tank. I wish that they would have considered that and just sent the kit with the rifle, but they didn’t. People will call me a liar, but I know it’s possible to get a 5/16″ group at 30 yards consistently with this weapon. There are times when I’m at my best that I can put ten rounds in such a tight group that I can hide them with a penny from quite a distance away. One of the things that I like about this particular PCP is that the manual comes with a bunch of fine tuning instructions to help you adjust aspects of it to your preferences. That means if that if the trigger is too tight, you’ll be able to loosen it. If the scope isn’t set well for you, you can adjust it. There are options, so it makes it easy for you to adjust in a way that will get the best results in your hands. About the only thing that you can’t change is the pistol grip, which is a little big for people with smaller hands. I will admit that this is a heavy rifle. Add a scope and a sling and you’re looking at ten pounds that you’re hauling around with you. Combine that with the amount of pumping you have to do, and it’s going to be an exhausting outing when you go to shoot. As per usual, I equate weight with quality and toughness, but for some people it’s a bit much and you might want to consider the Discovery instead if the weight is going to bother you. Incredible power and accuracy. I have not been displeased with the way that this gun shoots, even after it’s been used for a while. It requires very little active maintenance, but gives you the chance to adjust several aspects of it early on, so you can make it work well for what you feel comfortable with. It has a four chamber silencer, so it’s quiet, and there is no recoil at all when you’re shooting. This is a really heavy gun, and adding a scope (which it doesn’t come with) will only make it heavier. You also have to really pump it up a lot since in order to get that much power, it uses up a lot of air very quickly. Just using this rifle is a workout. If you’re willing to put up with that, then it’s not a big deal, but some people will quickly tire, literally and figuratively, of it. As I mentioned at the beginning of this review, I’m sentimental about this particular PCP, but it does have it’s flaws. For me, those flaws are worth dealing with, but for a lot of people they will be deal breakers. However, if you’re willing to deal with the physicality required to use this PCP, you’ll find that it works great consistently and for a long time, which is the best thing in my book. 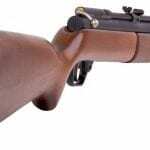 What is the Best .22 Air Rifle? whats the best caliber to hunt crows with? Hi Jake, I would go with the .177. Bill. Hi Jake, Id take my .25 over my .177 any day. Like they say sometimes you just want a bigger hole. .25 is overkill for Crows. The .22 is biggest I’d go for Crows, and the .177 is my personal preference. Please check the laws before shooting ducks with a single projectile. Federal law does not allow ducks to be shot with lead or a rifle. Don’t mean to ruin your fun just don’t want you to get in trouble. i am new at this game and I have been reading your reviews and i have found them very useful. I have come to a conclusion that i am going for RWS .22 model 34 andor the Benjamin Marauder PCP Air Rifle. I aim to hunt small game such as rabbits, guinea fowls, warthogs and duiker not for sport but for food. Please confirms if i have made the right choice because i need to hit what i aim at a distance and kill it instantly because that means food on the table.These animals don’t normally let you get closeup and if you miss the first shot they are gone. Unfortunately or fortunately in my country Botswana a .22 is the highest unlicensed caliber. To apply for the higher licensed guns is a nightmare. When you say the Benjamin Marauder PCP does not come with a scope do you mean you have to buy it separately or what? and which scope did you used on yours. What type of ammo would be most effective. Keep in mind to that the Diana will require a springer scope because of the harsh recoil. It will break ordinary scopes. I have had both guns, I kept the marauder. I have both guns that your talking about. I love my RWS 34 in .22 but it takes a lot of practice to shoot accurately and is not as accurate as the Benjamin Marauder. The Marauder will have a lot more power and will shoot farther distances with ease. They typically don’t come with a scope but can be bought in a package that comes with a scope and sling. I have a UTG scope on mine which is excellent for the money. I only use my 34 .22 on birds and maybe would on a rabbit but I use my Marauder more often and have taken birds past 50 yds no problem even a few at 100 yds and many in between. For your situation the Marauder would be a better choice. For the Marauder – how do you pump it up? Sorry but I can’t seem to find this information. The Benjamin Marauder is a precharged pneumatic (PCP) gun. You power it with high pressure air (HPA). You will need a fill source such as a specialized PCP hand pump, or a HPA air tank. Piston guns weather spring or nitro are difficult to shoot right away and take a lot of practice and very hold sensitive because they move before the pellet has left the gun. By move I mean the piston moves. You don’t typically clean air guns at all, maybe and initial if it comes really dirty from the factory, but never after that. FPE and FPS are related but you have to understand the physics behind the two, a really light pellet will be going fast at first and slow down quickly and have the same FPE as a heavier pellet that is slower but maintains its speed. I would never shoot or tune (pcp) an air gun to shoot above 950 FPS, pellets tend to destabilize and are less accurate above that speed at least for me close to sea level. But don’t worry if the box like the NP2 from Benjamin says 1400 FPS shooting a slightly heavier pellet will slow it down to around 800-900FPS. The other reason you don’t want to shoot pellets at high speed is that once you break the sound barrier the gun will crack like a .22 long rifle. I prefer .22 over .177 I can’t give a scientific reason as to why other than the .22 is capable of generating more FPE. I have shot the same game with both. I would like to use a Marauder for ground squirrel and rabbits. Some of this shooting will be at close to 100 yards. What caliber would you recommend? Already have the SCUBA gear so air is not a problem. Maybe the .25, I think that would be a stretch for a .22, not impossible though. Cool! That’s a clever way of loonikg at it! Not new to air rifles, but looking to get my first PCP, and the Marauder with the synthetic stock is looking to be the way i will be going. My question is, filling it up in the field. From what I gather you are limited to A) a scuba tank (which while hunting would be HORRIBLE to lug around) and B) a floor pump. Is it feasible to think that a smaller air tank (like a paintball gun tank) could be used to refill the PCP in the field? Thanks and GREAT SITE with alot of great information!! I have a generation 2 gun in .22 caliber shooting 18.3 grain JSB’s at around 850fps and from 3000 to 1900psi I can get as many as 60 shots per fill, now when have you ever shot 60 times while hunting? Target shooting? Yes. The hand pump should be very easy to use unless you weigh less than 160Lbs. Yes they make mini bottles but I don’t have one. How long will the maurader hold air? I am new to real air rifles. Will the Maurader .22 be capable of 1 shot kills on possums. I have tried shooting them with my trail .22. When they were in my garden, but it always takes multiple shots. What do recommend for getting rid them in one shot. I have dispatched many opossums with one head shot with both of my >25 cal Marauders. What is the best caliber for groundhog/woodchucks. About how far can you kill them humanly in the head?